You've seen them on TV... the children with dirty faces, sad eyes, and threadbare clothes. 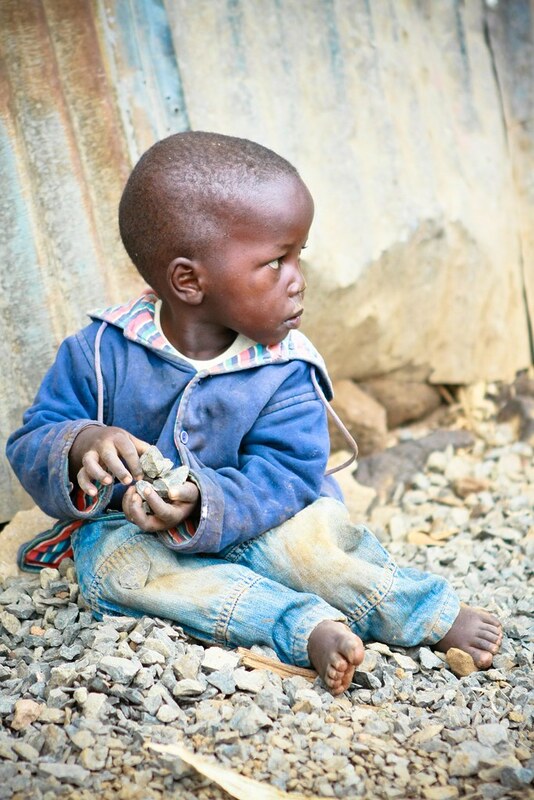 Children living in devastating poverty, in need of proper nutrition, health care and education. 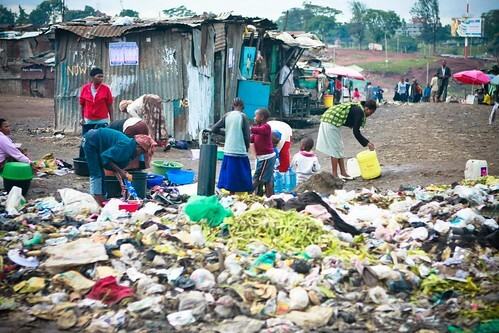 Children desperate enough to pick through garbage for survival. Perhaps you've watched the entire show, moved, but unsure that one person can really make a difference. Does your sponsorship really change a life? Are these children real, and do they really need our help? Six Compassion Bloggers recently flew to Africa along with four trip leaders to answer those questions for us. You can't always believe what you see on TV, but Compassion International's work is real. And so is the need for sponsors. I encourage you to read their posts, like this one, and this one... will you? Will you make it personal? It's not enough to say "someone else will help them". That someone can be you. It's not enough to say "but I can't afford $41/month". The majority of us have enough if we're honestly willing to part with it. Is a life worth a coffee a day? A meal in a restaurant? What would you be willing to give up to save a life? It's not enough to say "I can't." God doesn't call the equipped, He equips the called. Will you trust Him and take the step forward to release a child from poverty in His name? Will you live simply so that they may simply live? Will you consider releasing them from poverty, so that they can release you from wealth? My relationship with Compassion Canada began five years ago in May of 2005 at a Geoff Moore & Mark Schultz concert at our church. My best friend, my mother and I had come to hear Mark Schultz, but we were moved to hear Geoff Moore speak of his first trip to Haiti. Through recounting his experiences, he taught us what sponsorship could do, and reminded us of the Gospel teachings to take care of the poor... mom and I knew that we had to do what we could. I was not working at the time, so sponsoring a child was out of reach financially. My mother offered to financially support one sponsorship if I would help her with the correspondence. I can't thank her enough for being willing to do this with me. That's when we started sponsoring Bessy, a little girl from Honduras who stole our heart. This May, we will celebrate five years of having sponsored Bessy. It took years of prayer, but less than 24 hours for God to reach deep into my heart and pull out three cherished dreams, making them a reality. Not only has He made it possible, He has made it abundantly clear that this is what He would have me do for Him. Yet to know that He wanted to. And barefoot... without a hope of ever finding the socks that God blew off my feet this past week. It's no secret... I have a passion for Compassion. I've been a sponsor for almost five years, and the more involved I get into sponsorship and Compassion as an organization, the more that passion grows. 1. To become a Compassion Advocate. 2. To become a Compassion Blogger. 3. To travel with Compassion to witness first hand the work that Compassion is doing, to help them in their work, and to share their work with others. God and I have had many front porch prayers about this... The more I prayed about it, the stronger those desires became. The more I prayed, the more things began to fall into place in preparation for those dreams to become a reality. I knew that the Compassion Advocacy was simply a matter of God's timing and not mine. The same applied to traveling with Compassion, although all along, I had felt it would take place in 2010 or 2011. The Compassion Blogger prayer was a bit more complicated. They don't have "Compassion Bloggers" in Canada the same way they do in the U.S. I received an email last week saying that my Compassion Advocacy application had been received and was currently under review. They told me that they would be in touch with me this week. Kayla Tompkins from Compassion Canada called me today to conduct a semi-formal interview for my Compassion Advocacy application. That one phone call combined two of my favorite topics; it didn't take any effort to get me to share my heart for Jesus and Compassion. Dream # 1 has turned into a reality! I am a Compassion Advocate. That alone would have been sufficient. I have learned to be content in what He gives us... but I am also learning that we serve a God who likes to blow our socks off :o) I'm acquiring a taste to having my socks blown off, much like some people acquire a taste for mushrooms or diet Coke with lime... I'll stick to the "go barefoot boldly", thanks! God seems to get a kick out of that these days! Compassion Canada has a different advocacy program than Compassion in the U.S. I asked Kayla about this today, and she explained that Compassion Canada doesn't have "Compassion Bloggers" in the same way they do in the U.S. Instead, there is one Compassion blog off the main Compassion website page, and the Regional Advocacy Coordinators contribute to this blog. I expressed my heart's desires to become a "Compassion Blogger" and to contribute to a Compassion blog, and she said that they would be willing to have me contribute as a guest Compassion Blogger, in fact, they'd appreciate some help with this. I'm thrilled!!!! Dream # 2 has also turned into reality!!! I WILL blog for Compassion, here, or THERE! Two out of three would have been more than enough for one day one year (or eight), but God wasn't finished. You know.... the whole socks thing. Compassion Canada generally has two trips to Compassion countries each year. I remember longing to join them on their trip to Honduras last fall, but that trip was canceled due to the political unrest in Honduras. The situation in Honduras has improved, and the trip has been scheduled for the end of June. They're also going to Peru in September, as well as the Dominican Republic and Philippines next year. No plans for Bolivia or Thailand in the horizon, but those may come in 2012 or later. Honduras, though... boy oh boy, God sure knows how to get my attention. We have sponsored three little girls in Honduras, including the one we've sponsored the longest, Bessy... The trip would involve getting first hand experience with Compassion centers, meeting with families and children in the Compassion program, and personally seeing what Compassion really does. And so much more! What an incredible opportunity to dive into the work Compassion does in order to come back armed with the knowledge and experience that I would have the opportunity to put to use in the advocacy work. I'd also get to meet with Bessy. As if I needed more of an incentive. The question is, is it time for that dream to come true? A few days ago, I wrote a post on my family blog about the spiritual side to finances, God's provisions, trusting Him, tithing, serving, giving it all to Him. It's not a coincidence that within days, I was asked if I would join Compassion in their trip to Honduras. I was told that I have until March 5th to make a decision and pay the deposit... after which, I will have until March 19th to complete the payment for the trip. Less than three weeks from now. I have been praying for this opportunity for a few years. It's coming to reality so fast, my head is spinning! Is this what God would have me do? That is the most important question. It doesn't matter to me how much I've dreamed of this, if God doesn't want it, I don't want it. I mean that. For example: It would probably be wise to run this by Terry first. *ahem* I'm sure that's part of His intentions. God is pretty thorough that way, never wastes an opportunity. It'd be just like Him to give me less than two days to break this idea gently to Terry. Oh boy. Ahhhh, I love moments like this. What a great opportunity to learn. Will you join me in prayer? I'd love to hear your thoughts, your insight, what you would do... please take the time to share your thoughts in the comments or by email. That's the beauty of the blogging community... we're not alone.